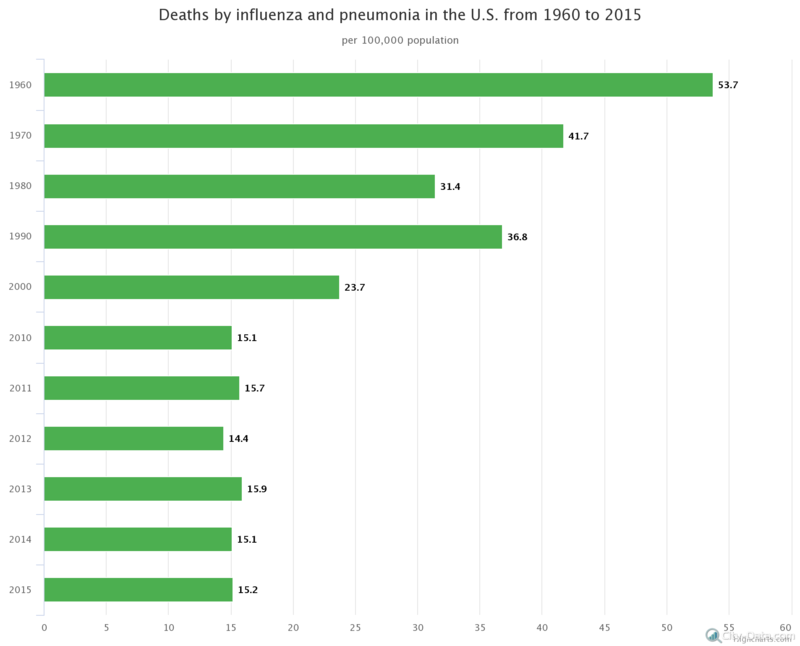 Deaths from influenza and pneumonia in the U.S. Influenza (commonly called the flu) is one of (if not the most) common infectious diseases in the world. The symptoms of the flu including cough, a sore throat, runny nose, fever, headache and muscle pains. Many people take specific measures to prevent becoming sick with the flu during the high flu season. Some of the most popular measures to prevent influenza include getting plenty of rest, frequent hand washing and maintaining a healthy diet. However, according to the Centers for Disease Control and Prevention (CDC), the best way to prevent the flu is through vaccination. Influenza is also a common cause of pneumonia. The symptoms of both diseases are similar, with pneumonia being a more serious infection of the lungs and carrying a higher risk of death. Unfortunately, influenza and pneumonia are some of the leading causes of death in the United States, accounting for about 15.2 deaths per 100,000 people in 2015. Let’s take a look at the statistics on deaths caused by influenza and pneumonia in the United States from 2010 to 2015: In 2010, these diseases caused 15.1 per 100,000 people. The next year (in 2011), the death rate increased to 15.7 deaths per 100,000 people in the U.S. In 2012, the number of deaths from pneumonia and influenza decreased to 14.4 deaths per 100,000 in the country. The influenza death rate spiked in 2013, reaching 15.9 deaths per 100,000 people. In 2014, influenza and pneumonia caused 15.1 deaths per 100,000 people; as previously mentioned, these illnesses caused 15.2 deaths per 100,000 people in 2015.